In recent years, Japanese beef, wagyu has been praised for its rich flavor, gaining fans all over the globe. While we all know that wagyu is delicious it’s hard to understand the different types of Japanese beef. We’ve rounded up 5 of the best Japanese beef to try and the best ways to eat them. It’s hard to come across someone that’s never heard of Kobe beef before. Perhaps you’ve heard your friends rave about the butter like texture or maybe you know about it because of the world-famous basketball player that was named after the red meat. Outside of Japan, the world Kobe beef gets thrown around a lot as if it’s synonymous with Japanese cattle, Wagyu. So what exactly qualifies as Kobe beef? First and foremost, Kobe is the name of a city in Hyogo prefecture. To be qualified as Kobe beef, the cattle must be born, raised and slaughtered in the city of Kobe. It’s exactly the same as how you can’t call any sparkling wine, champagne. It specifically has to be produced in Champagne, France. Furthermore, the cattle are required to be 100% pure Tajima, a Japanese black cattle. After the cattle are slaughtered and have passed a strict criteria, it is finally qualified as an authentic Kobe beef. In fact, it’s considered that only 3,000 heads of Tajima cattle are certified as Kobe beef each year. The difficult process doesn’t end here. To serve Kobe beef at a restaurant, one must be a paying member of the Kobe Beef Marketing & Distribution Promotion Association. While there are many restaurants out there that claim they serve the most sought-after beef in the world, it is extremely hard to find a place that actually offers the real deal. If you ever come across the chance of eating Kobe beef, I highly encourage you to eat it as a steak. It’s the best way to taste the authentic flavor of the prestigious beef without any additional flavoring. A Kobe steak is sublime, packed with intense flavor and will melt right away in your mouth. While foreigners may argue that Kobe beef is the best beef in Japan, many Japanese will tell you that you need to try Matsuzaka beef in Japan, many Japanese will tell you that you need to try Matsuzaka beef before coming to a conclusion. Considered as Kobe beef’s biggest rival, Matsuzaka is what many Japanese would define as the epitome of fine dining. 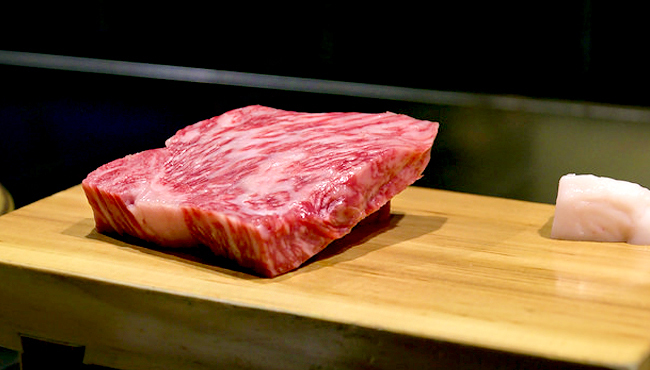 What distinguishes Matsuzaka beef from other wagyu is that they are slaughtered after 3 years old. Unlike the other cattle that are bred for beef, these cattle live longer than any other beef cattle making the texture and flavor of this beef exquisite. The tender beef is so soft that it gives off a melt-in-your-mouth sensation. A popular one-pot dish, Sukiyaki has long been loved by the Japanese. Consisting of thinly sliced beef and vegetables, with a sweet and savory broth. Sukiyaki is a dish that many Japanese people eat when the leaves start to change its color. Eating Sukiyaki is an amazing experience, but eating Sukiyaki made out of Matsuzaka beef? It’s a life-changing experience. The broth tastes infinitely better with Matsuzaka beef and the flavor of the meat is literally bursting with deliciousness. One can say that Ohmi beef is one of the country’s best-kept secrets. Ohmi beef comes from the selected cattle from Shiga prefecture, which is famous for Lake Biwa, the biggest lake in Japan. The cattle are raised in an environment surrounded by water and beautiful nature and are fed on a diet with nutritional balance. The end result of this is a beef with an unusually high level of marbling, a significantly lower melting point, and a rich, smooth flavor. In terms of beef cattle, Ohmi beef is considered to have the longest history as a wagyu dating all the way back to 400 years. It ’s also a famous fact that Ohmi beef was eaten during the Edo period, an era long before meat consumption was common in Japanese households. Eating a grilled Ohmi beef is extremely juicy and full of aroma. Not only is eating an Ohmi beef BBQ skewer delicious but it also only costs the fraction of the price of eating a steak. It’s a great way to try Ohmi beef if you’re a first-timer. If you’re new to wagyu, you may have never heard of Yonezawa beef, but it is touted as one of the best beef in Japan alongside Kobe and Matsuzaka beef. The top-grade marbled beef is carefully raised in the Southern part of Yamagata prefecture and fattened for 32 months in a natural environment with widely ranging temperature. Take one bite into this beef and enjoy the juiciness and extraordinary tenderness of the unforgettable beef. Fun fact: the superb taste of Yonezawa beef was first discovered by a British man named Charles Henry Dallas. Dallas, an English teacher at Yonezawa wanted a taste of home and asked a chef to make a dish out of the cattle in Yonezawa. Taken aback by the delicate flavor of cattle from Yonezawa, he took a Yonezawa cattle with him to Yokohama when he finished up his term in Yamagata. – And the rest is history. Shabu shabu is a Japanese hot pot dish consisting of thinly sliced meat and cut vegetables that are put together in a hot broth. It is usually eaten by dipping into either a sesame or ponzu sauce. Shabu shabu works exceptionally with the delicate flavor of Yonezawa beef and the sauce does not overpower the flavor of the beef. it shifted as a beef cattle. When Maezawa beef was first introduced to Tokyo in 1969 it had a horrible reputation. After years of hard work poured into improving the quality of the cattle, Maezawa beef started to gain recognition throughout the country. The farmers at Maezawa make an utmost effort to create a stress-free environment for the Maezawa cattle as it can affect the quality of the beef. One of the best ways to eat Maezawa beef is by eating it like a sushi. Yes, as in that sushi with raw fish and rice. Using seared fresh Maezawa beef as a sushi topping, this will instantly become your new favorite food. Eating a Maezawa beef in a sushi-style is such a luxury. Think of it as eating a foie gras or truffles, it’s a delicacy that should be savored in small quantities.